This entire game is based on that one scene from The Descent. There’s a lot to like about Outlast. It’s a non-combat stealth horror game made by a small team of veterans that sports super high production value but keeps things simple. The sound quality is fantastic and the graphics are nice and it manages to be pretty scary now and then. It’s got a great mechanic (a nightvision camera) that it uses well. It’s exactly the type of game that interests me in this post-Amnesia world: small, contained, high-quality, and (hopefully) experimental. So it is with great regret that I must report that I did not like Outlast very much. There are a number of obvious problems with Outlast. The story is fairly routine and inconsequential to gameplay. The game goes for excessive gore, which is probably exciting to kids but is pretty boring to me. The stealth system is pretty bad, and it’s often easier to just sprint through a level than to try to sneak around. The level art and enemy design is pretty repetitive. The encounters with one big brute enemy get old really fast. Not just the story arc (although that’s also predictable), but the core level design. The levels follow such a routine, obvious pattern that everything from item placement, to pop-out scare pacing, to encounters with other characters is easy to read way in advance. In a game with very few interaction mechanics (you can move, hide in lockers, and look at things through night vision), predictable level design is a serious problem. Comfort is the antithesis of horror. When the player feels comfortable, they aren’t feeling scared. 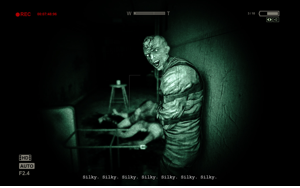 In a game like Outlast, one of the primary ways that a player comforts himself is by anticipating what will come next. This is a mode of thinking that treats the game we are playing like a system. Every time you think, “oh, the obvious flashing light is to the left, so I’ll go right first,” or “this would be a good spot for a hidden item,” or “it’s been a while since the last pop-out scare, I bet one’s coming up,” you’re thinking about the game as a system that you are trying to solve. You’re not navigating the dark hallways of a corrupt insane asylum that’s been experimenting on its patients, you’re solving a Rubix Cube. Guess which one of those types of play is scarier. Outlast’s main problem is that it has very little to work with to keep you uncomfortable. The levels are narrow and linear, and there’s only ever one right way to go (if there’s more than one way, there’s probably an item at the end of the alternate passage). The game mechanics are well implemented but extremely shallow, which makes the actual moment-to-moment gameplay very repetitive. The game dutifully saves before every major encounter (and immediately after) and helpfully alters the music to let you know exactly when you are in danger and when you are not. As a result, you know enough to see through the game content and treat it like a Rubix Cube. The developers try to combat this with stealth sections. Sometimes they work; when you are hiding in a dark corner and can’t see your pursuer, it can be pretty tense. But the stealth sections quickly devolve into a repetitious, frustrating challenge, which feel unfair. After a few attempts, you realize it’s easier just to run for it. Now you’re treating it as a system again, and the power the game had over you is lost. The only remaining trick the developers have up their sleeves is pop-out scares. But even those get old really fast. They are startling, and knowing that they could pop something out at you at any time is stressful, but they happen so often that the easiest solution is to just take yourself out of the game. Once you stop caring about your character the pop-out scares have no power, and their appearance becomes yet another thing to try to predict. It’s a shame, too, because there are some great scenes in Outlast. My favorite is a bit late in the game when you finally exit the foreboding asylum into a rainy courtyard. It’s almost pitch black but the area is punctuated by lightning. This section only lasts a minute or two until you’re guided back into more strictly-linear passage crawling, but it’s a great scene. There are some other nice touches as well. The night vision camera pretty much saves the day by giving you a very narrow cone of vision and forcing you to navigate unfamiliar territory with it. There’s a battery mechanic that creates some pressure between using the night vision to see your surroundings and trying to conserve your small supply of batteries for an emergency situation. The actual movement mechanics are good and the game isn’t buggy or broken (although the way the camera rocks made me feel like my character is wearing clown shoes). There’s some really nice automatic first-person body and hand animation that I haven’t seen done this well before. But in the end, the thinness of the game mechanics and the predictability of the level design sucked all the scariness out of this game for me. The reliance on pop-out scares further removed me from the game, and by the end I was just Rubix Cubing my way to the finale. Well at least the actual macguffin of nanomachines took me by surprise, if only because it made so little sense. I’ve heard Whistleblower is good though so I’m going to give that a go some time. Non combat games are prone to this failing of predictability, in my opinion. I know that the idea is to make the player feel more vulnerable, by giving them no defense save flight – but In reality what it means is that you have less options as a player for dealing with situations in game, and less situations and solutions the level designer can put you in. Do you ever feel like the amount of knowledge you have concerning survival horror and the amount of experience you have from playing said games contributes in a negative way to your perceptions of survival horror games? I’m genuinely curious about this. I actually agree 100% with you on Outlast, but I’ve noticed a lot of horror games have left me jaded, and I wonder if that might not be because of the extensive amount of time spent playing other games from this genre. I wonder how you would feel if Outlast was your first survival horror game you’d ever played? I don’t think treating it as the first excuses the strict linearity, but it would remove some of the “Rubik’s Cube” predictability that you talked about. Keith, I don’t think it’s combat specifically that makes some of these games boring. Combat is just an activity with some gameplay depth. Any other activity with depth would work. Siren is effectively non-combat because combat is always too dangerous, and it’s very deep. The real problem is just not enough depth (in any area) to sustain interest for the duration of the game. NegFactor, there’s probably an element of truth to the jaded angle. I probably notice a lot of stuff that novices would not. But if your game design is “good for people who don’t know any better,” I still think that’s a pretty poor design. I generally have a policy of never really watching LPs/playthroughs more than 30 minutes into a horror game, basically so I can get a sense of the atmosphere but not really get spoiled much. I found it a bit underwhelming from what I’ve seen, though I keep telling myself I’ll get it sometime just because some friends of mine quite love it, thus it’s always been at the bottom of my “buy this later” list. I certainly don’t think a the lack of combat makes horror games boring by default, more that too many developers can’t think outside of the box of violence very well. Non-combat horror games have been around longer than Alone in the Dark/RE style horror games have, and even outdated them. We quite need both, though, because pigeonholing things into certain mechanics for a genre like horror just makes things predictable. I suppose your right Chris, but as I read your reply, another point occurred to me – It’s not the lack of combat, it’s the break in immersion, which leads to a break in the fear. In siren, you CAN fight. And whilst it’s largely ineffective, it remains as an option. In games like amnesia though, the option is just unavailable. It’s not so much the lack of combat as a lack of depth, like you said, but it’s also like those invisible walls in Skyrim, Oblivion and Morrowind, “You can go no further: Turn back”. It’s a entirely artificial, and obviously constructed barrier, that breaks immersion immediatley. 1. Sneaking so as not to be caught. 3. Scripted events in which failure does not exist. I feel that in removing power from the player, developers walk a fine line between creating a truly stressful experience or a game where you are more frustrated than scared. Outlast unfortunately looks like one of these games to me. What splendor there is to look at in its sheer visual design appears to be met in equal with an endless stream of things jumping at you and you attempting to outrun them. I am kind of left wishing for that happy medium between a classic title like Resident Evil, with its emphasis on inventory management and making the difficult decision of when to stay and fight, and a game like Amnesia, where you are forced to be uncomfortably close to a monster and with little to do about it. I think Chris will find this author’s article quite interesting.